The density kit combines with a precision or analytical balance to make the process of density determination easy, reliable and precise. The density kit is installed on the floor of the balance's enclosed weighing chamber. 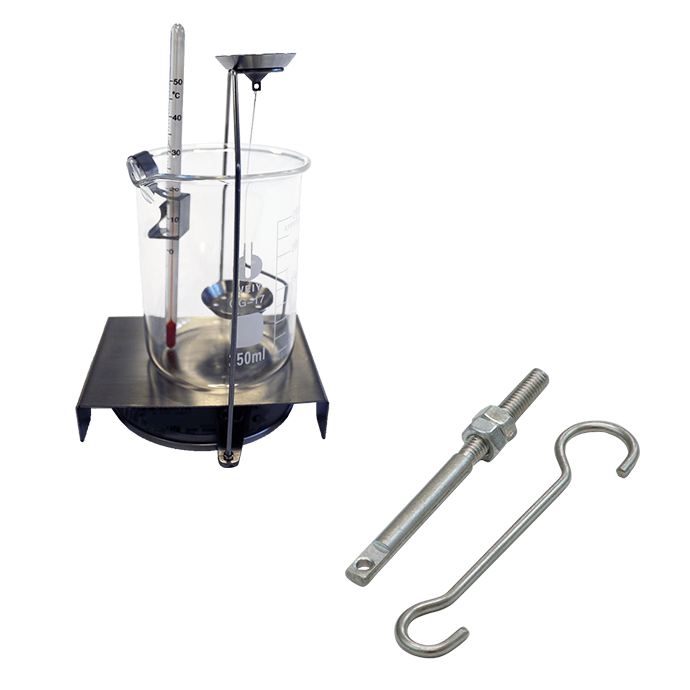 The density kit includes a glass beaker, a suspended weighing cradle to replace the standard pan, independent support for the beaker of fluid, thermometer with clip for suspension in the fluid, and glass sinker of known volume for density determination of fluids. This density determination kit is for Solis and Equinox Analytical Balances. It comes with a thermometer, a holder, a beaker, a beaker holder and a replacement pan assembly. Factory fit a weigh below hook to Adam Equipment's bench scale to perform below balance weighing. Ideal for materials testing applications. The weigh below hook for the Nimbus and Eclipse balances allows for below balance weighing. This density determination kit is for balances with the 90mm ø pan sizes. It comes with a thermometer, a holder, a beaker, a beaker holder and a replacement pan assembly. This density determination kit is for balances with the 120mm and 160mm ø pan sizes. It comes with a thermometer, a holder, a beaker, a beaker holder and a replacement pan assembly. The weigh below hook for Nimbus balances with the 400 x 300mm ø pan sizes allows for below balance weighing.